Where am I? > Home > News > Could chip shop changes help tackle obesity? Could chip shop changes help tackle obesity? Lovers of traditional fish and chips are embracing a more health-conscious version of their favourite food, a new study suggests. Led by researchers from Newcastle University, the study looked at whether takeaway owners and diners could see the benefits of shrinking their meal sizes. In partnership with fish and chip shop supplier Henry Colbeck, the study tested the popularity of the company's "Lite-BITE" box designed for a smaller meal of around 600 calories. After reviewing sales and conducting interviews, researchers found customers were satisfied with the Lite-BITE box's smaller-than-usual portions sizes, which fall within Government nutritional guidelines. Louis Goffe, the report's lead author and a research associate for Newcastle University, said: "I love fish and chips and this research aims to find a way that we can have our fish and chip treat - but less of it. "We focussed on coming up with a solution which provides a healthier meal option but equally importantly works for the fish and chip shop owners. "The sales show that there is a demand for smaller portion meals and we hope this will act as a template for others in the fast-food sector to follow." The findings, published in BMJ Open by researchers from Fuse - The Centre for Translational Research involving Newcastle, Durham and Cambridge Universities - explain how the success of the Lite-BITE boxes reflects the "longer-term viability" of portion control. 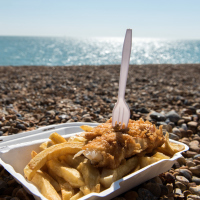 Mr Goffe added: "Public health teams have found it difficult to engage with takeaway owners, but we discovered that wholesale suppliers in fish and chip shops are trusted by owners and offer a way to influence portion size. If you're living with medical problems related to obesity and looking for great value travel insurance that meets your needs, check out our range of dedicated medical travel insurance today.